This is a revised, updated, and expanded version of the original 25 Days to Better Thinking and Better Living. 106B 30 Days to Better Thinking and Better Living $12.49	 Qty. There is nothing we do as humans that does not involve our thinking. Our thinking tells us what to believe, what to reject, what is important, what is unimportant, what is true, what is false, who are our friends, who are our enemies, how we should spend our time, what jobs we should pursue, where we should live, who we should marry, how we should parent. Everything we know, believe, want, fear, and hope for, our thinking tells us. It follows, then, that the quality of our thinking is the primary determinant of the quality of our lives. It has implications for how we go about doing, literally, everything we do. Therefore, learning to think at the highest level of quality, or to think critically, is too important to leave to chance. Critical thinking is the disciplined art of ensuring that you use the best thinking you are capable of using in any set of circumstances. Through developed critical capacities, you can take command of the thinking that is commanding you. Becoming a critical thinker requires that you learn to observe, monitor, analyze, assess, and reconstruct thinking of many sorts in many dimensions of human life. It requires the building of important habits of mind. It has implications for every act that takes place in your mind. It requires a special form of dedication and perseverance, honesty and integrity. It can be done only if taken seriously and pursued throughout a lifetime. This book will show you how to use your mind to improve your mind. Each of the ideas in it can help you take command of the mind that is controlling your thoughts, emotions, desires and behavior. Our hope is not in a miracle transformation, but in laying a foundation for your future intellectual and emotional growth. We are merely scratching the surface of deep and complex topics. We do not provide a quick fix, but rather places to begin. When you begin to take your intellectual growth seriously, you begin to see payoffs in every part of your life. But first, you must wake your mind up. You must begin to understand your mind. You must begin to see when it is causing you problems. You must begin to see when it is causing others problems. You must learn how to trap it when it tries to hide from itself (using one of the many forms of self-deception of which it is naturally skilled). You must discover some of the trash and nonsense you have unknowingly taken in during years of passive absorption - to which all of us are subject. This book will show you how to begin. William James, the father of psychology in America, once said, "A great many people think they are thinking when they are merely rearranging their prejudices." Every thing we do involves thinking. Our quality of life depends on the quality of our thinking. But for the most part, very few people are taught how to engage in clear thinking. If our thinking is flawed, it follows that we will experience problems in life. According to Linda Elder and Richard Paul, the authors, "Many of our regrettable actions emerge from faulty reasoning." Yet very few people really question the quality of their thinking. It is human nature to believe that what we think is right. "Humans are prejudiced. We stereotype one another. We are often hypocritical." And we often engage in thinking which justifies behavior that includes stealing, killing and torture. "In short, we naturally think that our thinking is fully justified." This book first shows us how we engage in thinking which is faulty. Next the authors show us that our thinking controls our emotions and our decisions - which of course leads to our circumstances. If you wish to change your circumstances, you must change your way of thinking. Then we are given the basics of critical thinking: Clarity, accuracy, precision, relevance, depth, breadth, logic, significance and fairness. The first portion of the book deals with shinning a light on how we actually think and the resulting problems from the way we think. Then the authors give us the foundation for understanding and developing our ability to apply critical thinking to our daily lives. After the introduction, the book contains 30 lessons for developing our critical thinking. The suggestion is that you read and work through a lesson per day. After you have completed the 30 day program, the authors suggest you start over and instead of doing a lesson per day, do the same lessons on a weekly basis. The book is well written and the lessons about how we think, or more importantly the mistakes we make in our thinking are very insightful. The daily lessons are a great way to methodically improve your thinking. As the authors point out, even the highly skilled at critical thinking make mistakes at times. So those who are novices should not be too hard on themselves but should engage in the lessons first on a daily basis and then on a weekly basis. Learning to master your thinking is a life long process. At the end of the lessons is an excellent suggested reading list. The appendix contains a glossary of terms which is very helpful. This is an excellent book for those wanting to improve the quality of their lives. Trying to improve your life without working on the root issue will not yield sustainable results. I highly recommend this book for any serious student of life and learning. In their book, Critical Thinking, A guide for improving Every Aspect of Your Life, Doctors Linda Elder and Richard Paul provide nothing less than a psychological GPS system for mental clarity. If you're serious about living according to your true intentions, then you must develop a capacity for critically thinking about what you think. At first blush, "thinking about what you think" may sound like a Zen Koan--don't be intimidated. With practical, incremental guidelines for challenging destructive, self-deceptive habits, beliefs, and vague thinking, you will be experiencing your world in vivid, HD clarity in just 30 days. If you've ever dreamt about being more effective, more balanced, and more content with life--follow this step-by-step program. It's amazing! It is ironic and in many ways tragic that you can go through 12 years of undergraduate education, 4 years of college, and 4-6 years of graduate school, and still never learn how to think. Educators mouth the words 'critical thinking', but in my 35 years as a college professor, writer, and public intellectual I have found that almost no one knows how to think. They may know what to think if they are good at memorization, but the all important skill of learning how to think is still a lost art. 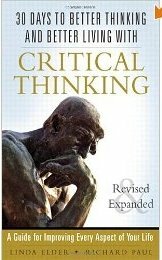 This makes the work of Linda Elder and Richard Paul vital to the progress of our democratic society, and 30 Days to Better Thinking and Better Living with Critical Thinking is their best guide yet on teaching people how to think, not just about Big Ideas, but about everything in life. Buy this book, change your life, and in the process make the world a safer and saner place to live." Critical thinking, the skill so ably taught in this book, is the solution to much of our emotional pain. Our minds are literally creating our lives. And often our minds sabotage us with faulty, distorted thinking. The result: bad choices and emotional disorders. If you want to change your life, it starts with changing HOW you think – this book will give you the tools. One of the qualities that sets us apart from thinking creatures of other species is our ability - if we choose to use it - to "think about our thinking". My husband, the pioneering psychologist, humanist and great thinker: Albert Ellis PhD - would remind people of that fact, tirelessly and constantly! In this substantial, clear and easy-to-read book by Dr. Linda Elder and Dr. Richard Paul…readers are offered stimulating descriptions, definitions, principles and suggestions for understanding and using thinking in effective ways in order to experience a better quality of life. The earnest dedication of the authors to contributing impactful ideas, and to encouraging their readers to allow themselves to experience growth in their lives through making choices to think and act in beneficial ways, is felt strongly throughout the whole book. That in itself is inspiring to read and feel. The topic is presented through combining the premises and ideas of the authors, with guidelines which allow us to identify problematic flaws in thinking in order that we may prevent such flaws, along with action strategies: indeed fine exercise for the mind and the brain. Additionally it is uplifting to read the urging of the authors to make the world we live in a more kind and healthy place. Let's do it! - by maximizing the benefits to ourselves, to others and to society, which can flourish as a result of applying the tools which allow us to think and act in healthy ways. Dr. Debbie Joffe Ellis (Psychologist, Author, Presenter). … I am sure that, if the thirty-day plan outlined in Elder and Paul’s book is followed consistently, it truly will improve the thinking and the lives of its readers. The thirty-day regimen starts with the chapter “Discover Your Ignorance” and moves along through chapters such as “Empathize with Others,” “Clarify Your Thinking,” “Be Reasonable,” and “Ask Deep Questions.” It is clearly inspired by Socrates, by his example of following the classical injunction “Know Thyself,” questioning the conventional wisdom of himself and his fellow Athenians. Moreover, it is important that this critical thinking regimen is not merely a matter of acquiring skills, but is a deeply ethical endeavor. That is made crystal clear in chapters such as “Be Fair, not Selfish” and (one of my favorites) “Don't Be Righteous: Show Mercy.” This small, easily readable book contains wisdom hard-won during the two authors’ dedicated and decades-long efforts to develop and communicate their conception of critical thinking, a conception that has rightly been very influential. 30 Days is a manifesto for approaching life and relationships assertively, for thinking clearly and fairly and uncovering your own biases and vulnerabilities to the persuasive tactics of others. Stop being an underdog or a domineering top dog and read 30 Days! 30 Days is an excellent text for new graduate students to introduce them to the kind of logic and critical thinking that underlies scholarly thinking. A hands-on approach to helping anyone who wants to see the world around them more fairly and clearly. Karen E. Dill, author, How Fantasy Becomes Reality (Oxford, 2009). A comprehensive and effective blueprint for getting one's thoughts on straight through the application of a proven intellectual concept to the practicalities of daily living. A critical thinking classic. There is much to gain from reading books written by Linda Elder and Richard Paul. This book carries on their tradition of elevating our thinking into the stratosphere while keeping our feet planted firmly on practical ground. The turbulent, globalized 21st-century world presents us with enormously complex and serious problems as well as unprecedented opportunities. If we are to survive and thrive in this environment we need to employ much better thinking than we have in the past. Fortunately, this book is a high-quality toolkit containing sophisticated, powerful, creative and critical thinking tools. It's also fortunate that the authors provide easy-to-follow, jargon-free instructions for the use of these tools. At a time when many Americans are faced with the need to make decisions on complex issues comes a book that offers a useful guide on how this can be accomplished. Using their conceptual scheme for critical thinking, Elder and Paul offer the reader a series of ideas, questions, and guidelines to help the reader develop clear thinking skills and to give the reader directions for living in a more rational and fair minded world. I have found that these clearly stated strategies accompanied by examples, the inclusion of well developed visual graphics, and the in depth glossary of concepts make the book both practical and readable. The book is a necessary addition to anyone’s personal library and a valuable guideline for understanding the need for critical thinking in one’s daily life. Through their elegant and readable style, Drs. Linda Elder and Richard Paul, preeminent leaders in the Critical Thinking Community, show us how to objectively and honestly navigate the “terrain” of critical thinking…. to better employ the essential skills and art of critical thinking to enhance our self awareness, and our interactions and relations with family, colleagues, society. A truly valuable book!